It is a slow and steady process, but plans to convert the former Monroe City schoolhouse into a museum in new Valmeyer are starting to take shape. In 2011, Melvin and Jackie Allscheid donated the vacant school building to the society following their purchase of the Alvin and Frieda Steinmann farmstead. The schoolhouse was completed in the early 1900s, and was last used in the mid-1950s. That’s when all the one-room schools were consolidated into community school districts. The structure, which was mostly used to store grain after the school had shuttered, was uprooted from its home near KK Road and relocated to South Cedar Bluff Drive, just across from the current Valmeyer school complex. 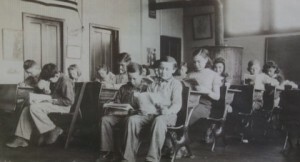 Pictured are schoolchildren inside the Monroe City schoolhouse, circa 1933-34. It is the heritage society’s goal to renovate the old schoolhouse, restoring a portion of the interior to its original function as a classroom and turning the remainder into a museum space and meeting area. Knobloch estimated the cost of this entire project, including building relocation, to be about $75,000. Donations from the community have been accepted over the past few years, spurred on most recently by the release of a new book and song. Knobloch published a book this past fall on the history of flooding in Valmeyer titled “49.58 and ankle deep on first base — A Flooding History.” The 395-page book details the floods of the 1940s, with major concentration on the Flood of 1993. 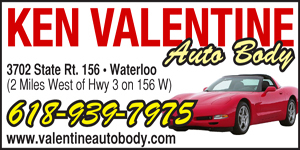 Cost of the book is $25, and it is available at Valmeyer Village Hall and at the Republic-Times newspaper office in Waterloo (205 W. Mill Street). The song “Valmeyer,” recorded by local band The Trophy Mules, was also released this past fall in recognition of the ’93 flood, with download sales at http://thetrophymules.bandcamp.com going to this museum project. “The recent donations have helped, but obviously much more is needed and will be gladly accepted,” Knobloch said. During a tour of the building on Monday, Knobloch led this reporter to the basement through a staircase that was built in the area of the school where a coal bin used to be. On the walls of this former coal bin, one can see the names of former students written with coal on their fingertips back in the day. One of those names is the late Harold Baum, who attended the Monroe City school in the 1930s and later became superintendent of Valmeyer schools. Knobloch said volunteer work recently performed inside the schoolhouse includes the installment of insulation in the walls and ceiling and new wiring and lighting, along with work on the basement area and other odds and ends. Upcoming tasks include work on the flooring and the installment of a bathroom in the basement. “We’re still hoping to get everything done by the end of this year, but we’ll see,” Knobloch said. Those wishing to donate to this project may send checks to: Valmeyer Community Heritage Society, P.O. Box 175, Valmeyer, IL, 62295. For more information on how to volunteer for this project, call 935-2142.